Hi, hope you guys are having a good Friday. We wanted to share our favorite August with you and do a little sweepstakes giving away some goodies we collected from PAX last week. We're also super excited about SMASH-TEMBER which will feature content Smash for the month of September leading up to the launch of the Super Smash Bros. for Nintendo 3DS on Oct. 3 tell us what you've been playing and enjoying in the comments below. You guys are awesome! Talk to you later. NO. PURCHASE OR PAYMENT OF ANY KIND IS NECESSARY TO ENTER OR WIN. 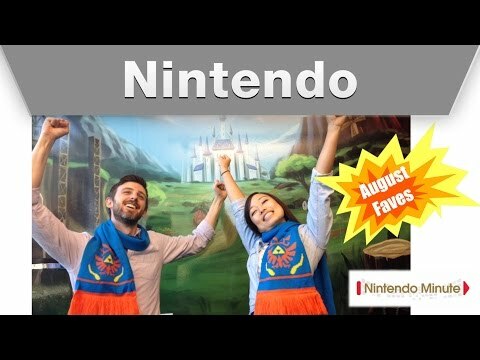 This Nintendo Minute August Favorites sweepstakes (the "Sweepstakes") is sponsored by Nintendo of America Inc. located at 4600 150th Ave NE, Redmond, WA 98052 ("Sponsor") and is open to legal residents of the 50 United States and Canada (excluding Quebec) who are age 13 or older and not an employee of Sponsor. Void in Puerto Rico and where prohibited or restricted by law. The sweepstakes starts at 4:00 PM PT on September 5 and ends at 5:00 PM PT on September 12 (the "Sweepstakes Period"). To enter tweet this exact sentence and fill in the blank "My August favorite is _." #NintendoMinute"sponsor will select five winners at random who will each receive a prize package consisting of one (1) $35 Nintendo eShop Card and one (1) Hyrule Warriors Scarf ($50 ARV per prize package). Each prize winner will be notified by email on or about September 17. Canadian winners must answer a skills issue to be a winner. Prizes returned as undeliverable or otherwise not claimed within ten (10) days after delivery of notification will be forfeited and awarded to an alternate winner. No. substitutions or exchanges (including for cash) of any prizes will be permitted, except that Sponsor reserves the right to substitute a prize of equal or greater value for any prize. All Nintendo employees and members of their households (whether related or not) are ineligible to participate in this sweepstakes. Eligibility will be determined by Sponsor in its sole discretion. All prizes are awarded "AS IS" and WITHOUT WARRANTY OF ANY KIND, express or implied (including, without limitation, any implied warranty of merchantability or fitness for a particular purpose). ALL FEDERAL, STATE AND LOCAL TAXES ASSOCIATED WITH THE RECEIPT OR USE OF ANY PRIZE ARE THE SOLE RESPONSIBILITY OF THE WINNER. This Sweepstakes is in no way sponsored, endorsed or administered by, or associated with Twitter. The sweepstakes and these Official Rules will be governed, construed and interpreted under the laws of the State of Washington. For a copy of the winners list or these Official Rules, send a written request with a self-addressed, business-size envelope to return: Attn: Sweepstakes Administrator - Nintendo Minute August Favorites Nintendo of America Inc., 2000 Bridge Pkwy, Suite 200, Redwood City, CA 94065.